Aussie Rules the World is a new movie to be released in Australia on July 21st. It covers the issues of Aussie rules looking outside to the world for a place beyond its home shores. 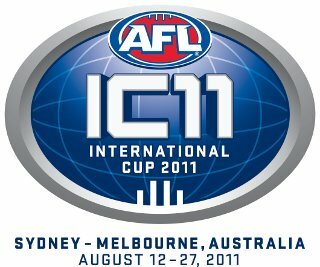 International footy followers will see plenty of familiar places and faces as Brett Kirk travels the world leading up to the 2011 International Cup and then reveals the passion for the game back on Australian turf as the world brings the game back to the native land. Please check out the trailer below. A couple of videos today. The first taken on the team bus shortly after arriving in Australia collecting Dragus' thoughts on his team's journey and the second video showing footage from IC11 and USAFL Nationals while Dragus is interviewed on AFL Grand Final day on SEN radio in Melbourne. Our old friend and International Cup icon, Mtutu from South Africa features in today's video which looks at the South African team during IC11. One of the highlights for the attendees at IC11 was the group songs of the Tongan team, often heard from their changerooms before and after their matches, here is a closer look (and listen). 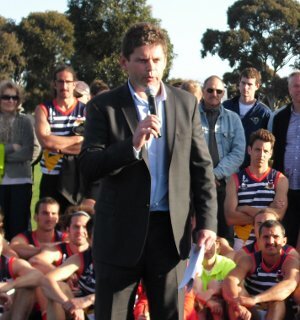 As the 4th AFL International Cup slips away to now being several months ago we thought it time to chat to the AFL International Development Manager Tony Woods about how he thought the tournament played out, ranging from questions on media, the women's division and staging it across two cities, to his own personal highlights of the experience. WFN: Overall I assume you were pretty happy with IC11. A record 18 men's teams including 3 new ones (Tonga, Fiji and France) and only 3 countries that have attended in the past were not there (Samoa, Finland and Spain), which given the status of international footy is a very good return rate. And of course the inaugural Women's Division with 4 nations and the Australian indigenous and multicultural (AIM) team. Particularly pleasing must've been having all the committed nations turn up... no late withdrawals or no shows in 2011. Tony Woods: I thought the event was fantastic – it was bold taking it to Sydney for the first time and including a Women’s Division. These elements alone significantly increased logistical requirements including transporting 23 teams from Sydney to Melbourne. We set out to insure this was the best International Cup yet and I think we achieved this. WFN: It seemed that needing 2 divisions for the men had become obvious after some huge blow outs in past Cups, and you used a lightning carnival on day 1 to rank the teams into the two groups. Personally I enjoyed it and think it gave all nations a fair go. Were you happy with the way that played out? Tony Woods: Again, the seeding round was a bold initiative but one we thought was imperative. The teams embraced it and it resulted in a wonderful carnival atmosphere to begin the football component on Day 1. Importantly it also resulted in the desired effect and in my view, the results vindicated the format.